If you are on insulin, you may at time needs to switch onto a different type or make of insulin. There can be a number of reasons why you may need to change. When you are put onto a new type of insulin, the insulin you are switched may have different properties that you may need to consider. Whilst relatively rare, people may experience signs of allergic reactions or side effects on different types of insulin. This is slightly more likely if switching from an animal insulin to a synthetic insulin, or vice versa. However, a switch between different types of brands of insulin can also have this effect. Allergic reactions or side effects may include redness, swelling or itching at the site of the injection. If the effect happens regularly or for a significant period of time, it is important to mention to your doctor or health team. More advanced allergies, which are more rare, include nausea and vomiting. Speak to your health team if these symptoms occur. Read our reference table on quickly different types of insulin tend to start, have there peak action and their duration. How quickly does the insulin begin to act? How quickly the insulin starts to act is a consideration that usually applies to short and rapid acting insulin and may dictate when you take your insulin in relation to a meal. Some insulin, such as short acting insulin may be taken a period of time in advance of a meal, whereas some rapid acting insulins may need to be injecting immediately before a meal. Your health team should advise you of when, in a relation to a meal, your particular insulin should be taken. When is the peak action of the insulin? This is useful to be aware of for any insulin, whether it is rapid, short, intermediate or long acting. Knowing when the insulin is at its peak can be a useful in avoiding hypoglycemia. How long does the insulin last? This question is often of importance for intermediate and long acting insulin, but can apply to any duration. Long acting insulin can last for as long as a day and some animal insulins can last longer. 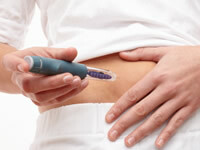 Why does it matter how long the insulin lasts? Knowing how long the insulin lasts can play a part in knowing when to inject or whether you may need to inject the insulin twice a day. People who switch from Lantus to Levemir will often go from injecting once a day to twice a day for example. Ask your health if you have any questions about how the speed or duration of your insulin may affect you.